Tbilisi, in the collective imagination of the judoka of the whole world, has a place apart. For years, the Tbilisi Tournament, well before it became a Grand Prix of the World Judo Tour, was already considered one of the most prestigious events on the planet. One had to dare to come to Georgia in the days of the Soviet Union, and one had to be even more courageous to face the high volume of fighters coming from the east. For Vladimir Barta, Tbilisi is afforded a special place in his heart: "I finished 7th here. The tournament was terrifying. When I returned to my country, I was received as if I had almost won a medal. That tells you how difficult it was to get out of the preliminary rounds. “There were no less than 10 Soviet Union athletes in each category and beating a Georgian was literally a feat of achievement. “But I must say that the Georgian public is extraordinary. They are passionate about sports and judo in particular. So yes, for the local athletes, to play in front of their public, was a definite advantage, but that did not prevent the fairplay and the respect for all the athletes. Armen Bagdasarov, an Uzbekistan silver medallist at the 1996 Olympic Games in Atlanta, also fought several times on the banks of the Koura River: "I have come here many times with the national junior then senior team of the Soviet Union. It was really difficult. There was a real friendly competition among us all but we wanted to be the ones on the podium. With the Tournoi de Paris and the World Championships, it was really the tournament where everyone wanted to reach the places of honour and winning was a historic achievement." Of all the testimonies that it is possible to glean around the tatami of the Grand Prix of Tbilisi, there is a common aspect: The Prestige. Participating in the Tournament and furthermore winning a medal added an important line on one’s prize list. The prestige has not disappeared, quite the contrary. The tournament, that became a Grand Prix of the World Judo Tour four years ago, has been internationalised. It has been equally opened to women and now enjoys media coverage that extends beyond Georgia and the entire region. In the morning, the atmosphere is at the rendezvous. If the Georgian athletes still have the advantage of the public, the beautiful judo is privileged by the thousands of spectators and undoubtedly winning here in Tbilisi still has a particular feeling, a prestigious sense of accomplishment. After her brilliant and first victory at the Baku Grand Slam, a few weeks ago, Stefannie Arissa KOYAMA (BRA) again qualified for the final of the day and was opposed to Maryna CHERNIAK (UKR). The 21-year-old Brazilian still lives in her native Japan and reached her second final in a row on the occasion of an IJF World Judo Tour event, which is an achievement as a relative newcomer to the international stage. After a 5th place in Düsseldorf and a 7th place in Baku, Maryna CHERNIAK, confirmed that she starts to have consistent results at the international level by reaching the final. The first good opportunity for KOYAMA to win again, came with an opportunist combination from standing position to groundwork, that the Brazilian exploited to take down her opponent, but only for a handful of seconds, not enough to score. The rest of the match was dominated by a fight for the end of the sleeves offering no opportunities for strong attacks but finally KOYAMA engaged a reverse sided tsuri-komi-goshi, which even if it was in slow motion, scored a waza-ari for a second amazing victory in a row for the pocket-sized Brazilian. Stefannie Arissa KOYAMA (BRA) defeated Taciana CESAR (GBS) in the semi-final while Maryna CHERNIAK took the advantage over the Portuguese, Maria SIDEROT. The first bronze medal contest saw Melanie CLEMENT (FRA) and Maria SIDEROT (POR) opposed for a place on the podium. The first effort to score was produced by SIDEROT, with a makikomi technique (sacrifice of her own balance) but for no score. But boosted by that first attack, the Portuguese continued to put pressure on her opponent, the French being penalised two times for passivity. The next penalty would have resulted in disqualification for CLEMENT, but the weak attempt of tani-otoshi of SIDEROT, gave a clear opportunity to CLEMENT to conclude with an uchi-mata for ippon and the bronze medal. There was one minute left on the clock. In the second bronze medal contest, Mariia PERSIDSKAIA (RUS) faced Taciana CESAR (GBS). After one minute, PERSIDSKAIA was penalised with a first shido for passivity, the long silhouette of CESAR apparently being difficult to deal with. But less than a minute later, the Russian engaged a powerful drop-seoi-nage technique to score a first waza-ari. A second shido was awarded to PERSIDSKAIA in the last minute but some tactical groundwork offered her some more seconds to finally hear the gong, which gave her the bronze medal. The final of the day opposed the silver medallist of the 2013 World Championships, Erika MIRANDA (BRA) who had a tough match against Charline VAN SNICK (BEL), the 2012 Olympic Bronze medallist, even though VAN SNICK achieved her Olympic dream in the lower category as she just moved up to the upper weight division. In the final itself MIRANDA was opposed to the best French hope for the future, Amandine BUCHARD. The French was the best chance of medal for her delegation in Rio in -48kg but facing weight management problems, the 21-year-old, did not go tot Rio. Being now in the -52kg category, she showed that she will be one of the main contenders in the coming years. But still the way is long until Tokyo 2020. In her semi-final, BUCHARD eliminated second seed athlete of the day, PUPP Reka (HUN). During the first two minutes, MIRANDA and BUCHARD seemed to study one another, the French trying to wrap up her opponent into a large makikomi movement, while the Brazilian tried to take advantage of several situations on the floor. But when they entered the final minutes, they only had one shido each, not enough to win the match. With 30 seconds left, the final seemed to go straight to golden score, when BUCHARD launched her version of kata-guruma for waza-ari, signing a beautiful comeback at the top level. The first bronze medal contest opposed Joana RAMOS (POR) and PUPP Reka (HUN). Halfway from the end, RAMOS scored the first positive advantage with a rolling makikomi for waza-ari, which was doubled up a few seconds later with the left handed same technique. The Portuguese, who has been on the circuit already for many years, finally concluded with an immobilisation for waza-ari. Her last presence on the podium of a World Judo Tour event was almost two years ago, when RAMOS won the Tyumen Grand Slam 2015. In the second bronze medal contest Darya SKRYPNIK (BLR) faced Charline VAN SNICK (BEL). After a powerful groundwork session, SKRYPNIK caught VAN SNICK in sankaku-jime and osaekomi but for no score as the Belgian escaped in time. Then the four minutes of the regular time did not give the opportunity to both athletes to score anything. In the meantime they were penalised with one shido each. It is in the golden score that SKRYPNIK finally launched a left handed drop-seoi-nage for a well-deserved waza-ari and a bronze medal. 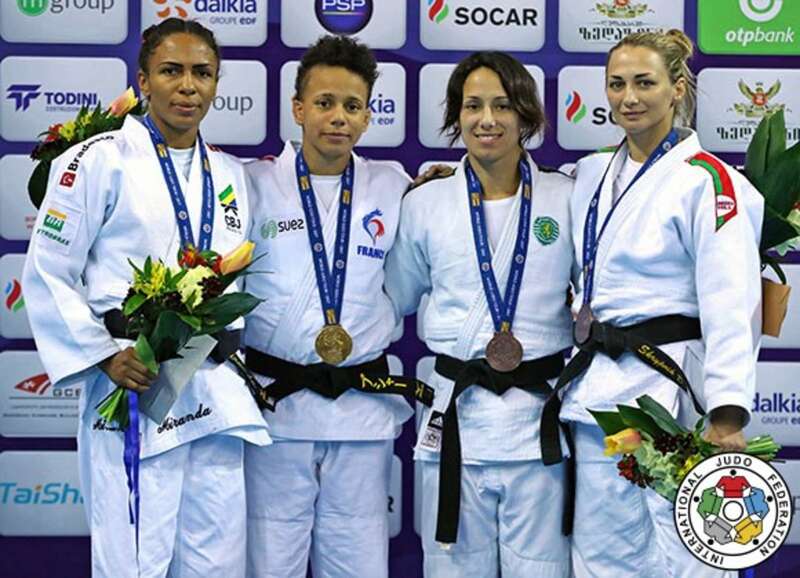 After a disappointing 5th place for her at the Paris Grand Slam, earlier this year, the current Olympic champion from Brazil, Rafaela SILVA, entered again a final in her impressive career. In the final she was opposed to Irina ZABLUDINA (RUS), who so far didn’t succeed in reaching a podium in 2017. The Brazilian defeated Natalia GOLOMIDOVA (RUS) to reach the final while Irina ZABLUDINA stopped Margriet BERGSTRA (NED) to meet with her illustrious contender. After one minute and a half, SILVA launched her trademark flying juji-gatame (armlock) but could not conclude the eye-catching technique. Looking confident and strong, the Olympic champion apppeared to be untouchable but it was the Russian who finally took the opportunity to conclude on the floor with an impressive piece of groundwork: juji-gatame for ippon. 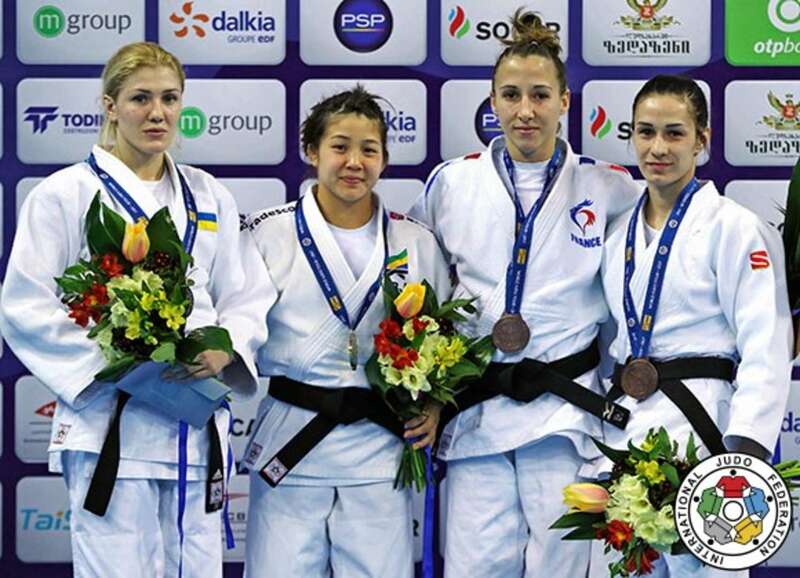 The first bronze medal contest opposed Khulan TSEREGBAATAR (MGL) and Margriet BERGSTRA (NED). After two minutes of hard combat for the grip, the Dutch scored a waza-ari with an aerial uchi-mata that she could keep alive until the end of the match to step on the podium and win a very first medal on the occasion of a World Judo Tour event. 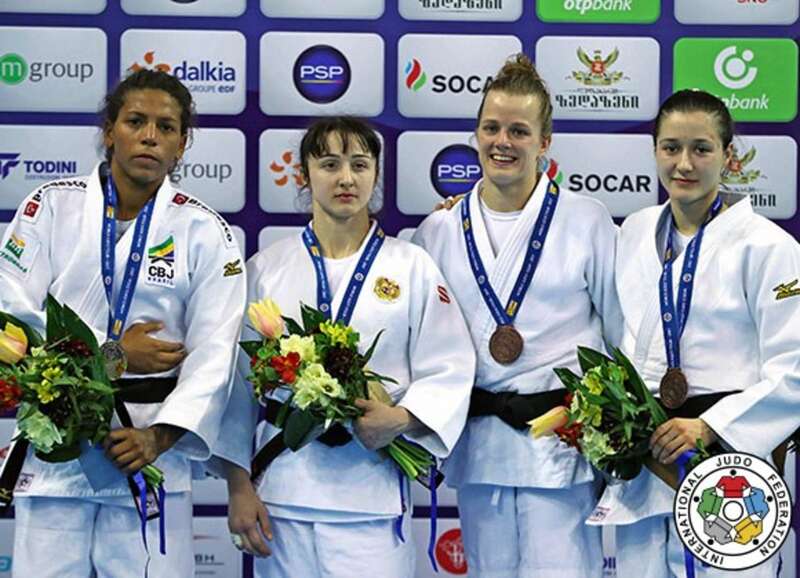 For the second place on the podium, Ivelina ILIEVA (BUL) was opposed to Natalia GOLOMIDOVA (RUS). GOLOMIDOVA scored the first waza-ari with an opportunist ko-soto-gake technique. Then it was the turn of ILIEVA to score a waza-ari as she invited her opponent for a little ‘dance’ that ended with GOLOMIDOVA rolling on her back, but not flat enough for ippon. It was time to enter the golden score. It was ultimately GOLOMIDOVA who scored with koshi-guruma for waza-ari. Top seeded athlete and home judoka Amiran PAPINASHVILI (GEO) was expected to be in the final by the whole public of the New Sports Arena and he did not disappoint his fans as the -60kg Georgian qualified for the last fight of the category with a win over Albert OGUZOV (RUS). The final produced a 100% Georgian show as the second athlete qualified was Lukhumi CHKHVIMIANI, also from the host country. CHKHVIMIANI took the lead against Mukhriddin TILOVOV (UZB) to face his teammate and already two-time Grand Slam winner, PAPINASHVILI. After less than a minute in the final, CHKHVIMIANI was penalised with a first shido for passivity. But CHKHVIMIANI scored the first in what looked like a weak attack, but on the edge of the competition area PAPINASHVILI, released his pressure and had no other choice than to follow his teammate for waza-ari. Being obliged to take risks in order to win, a few seconds before the end, PAPINASHVILI was counterattacked for a second waza-ari and a surprising win. The first bronze medal contest featured Phelipe PELIM (BRA) and Mukhriddin TILOVOV (UZB) fighting for a place on the podium. The first four minutes of regular time were not enough to differentiate the two athletes who entered the golden score with a shido each. Almost two more minutes later, the score was still the same and both PELIM and TILOVOV seemed incapable of finding a slight opportunity to finally score. But after 1 minutes and 55 seconds, the Brazilian went under the centre of gravity of his opponent with a super yoko-tomoe-nage for a winning waza-ari. 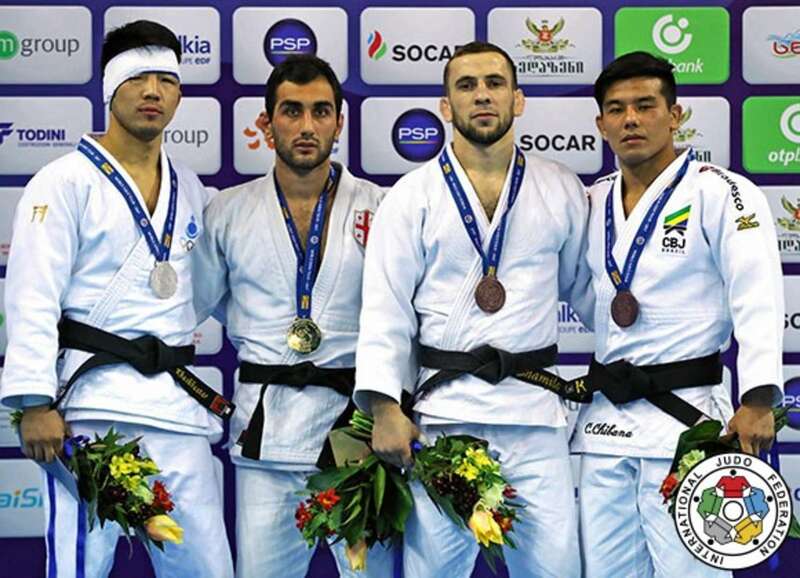 PELIM won his third medal in a Grand Prix here in Tbilisi. In the second bronze medal match was a Russian story as Islam YASHUEV (RUS) was opposed to OGUZOV. The danger came after less than 20 seconds, from OGUZOV who launched a flying juji-gatame from which YASHUEV easily escaped. Half way to the end, OGOZOV was penalised with two shades for passivity though. Then it was YASHUEV’s turn to be penalised for a forbidden groundwork defence. After a last sequence where both athletes blocked their opponent to build positive judo, they were penalised one more time. With only two penalties on his side, YASHUEV won the contest to step on the podium. The last final of the men’s categories opposed the third Georgian athlete of the day to fight for gold as Lasha GIUNASHVILI (GEO) faced Tumurkhuleg DAVAADORJ (MGL) after having defeated Charles CHIBANA (BRA) in first the semi-final. On his side of the draw, DAVAADORJ eliminated Yakub SHAMILOV (RUS) to face the Georgian. In the final, after 45 seconds, DAVAADORJ was penalised a first time for blocking his opponent, who was warmly supported by his home public. Both athletes engaged a battle of strong men, the Mongol looking a bit tougher than GIUNASHVILI, which was confirmed a little later, when the Georgian literally entered into a wall that countered his attack for waza-ari. With only a few seconds left on the clock, DAVAADORJ was controlling the end of the final but maybe a bit too much. Penalised two more times, the last a few seconds before the final gong, the Mongol could be angry at himself. With this unexpected victory, the public could exult like in the ‘good old times’. Sergiu OLEINIC (POR) and Yakub SHAMILOV (RUS) were opposed in the first bronze medal contest. Halfway to the end, SHAMILOV possessed a strong lead with a waza-ari scored earlier during the match with a sumi-otoshi. 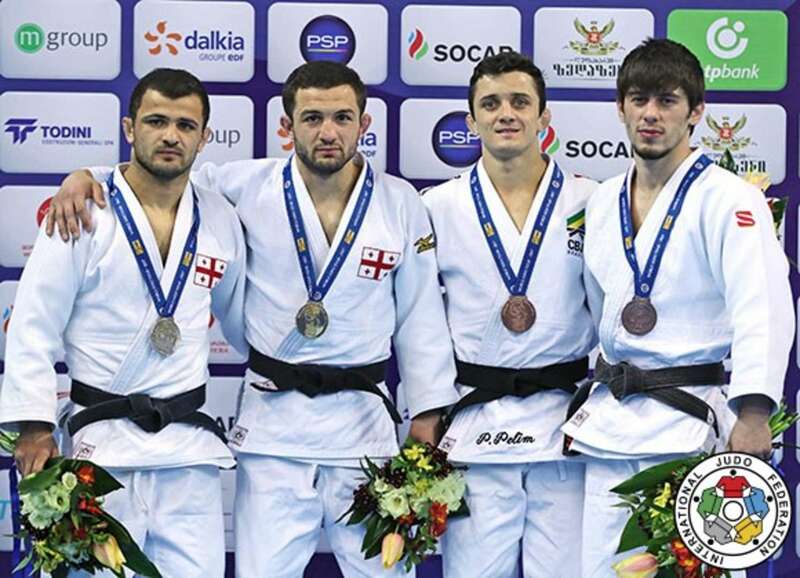 Despite all his efforts to put pressure on SHAMILOV, OLEINIC couldn’t score and even if the Russian was penalised two times for passivity, his early waza-ari offered him the bronze medal. Slovak Matej POLIAK faced Brazilian Charles CHIBANA (BRA) for the second spot on the lower step of the podium in this last men’s category for the day. If the Brazilian was seeking of the third victory on the occasion of the World Judo Tour event here in Tbilisi (2 Grand Slam gold in Tyumen 2014 - Moscow 2013), he had to concede the victory to GIUNASHVILI in the semi-final. Would his experience at that level be enough against POLIAK who so far had only a European cup medal to his prize list? The answer came quick as it took a little more one minute for the Brazilian to score a superb ippon with a koshi-waza technique that propelled POLIAK flat on his back.